Is there a beach in Barcelona? Ohh you can't miss that chance in this lovely and hectic city in summer. Barcelona has got big, relaxing, peaceful beaches. In any season, going the beaches is a must activity. In winter you will be fascinated with beaches' amazing scenery. Big, long and large beaches make the landscape marvelous. You can sit on the clean and fluffy sand and watch the sunset. Take your drinks and enjoy being isolated from stress of the city life. So what about summer? If you plan a Barcelona city travel in summer you really should go seaside and enjoy the sea. In summer, the beaches will be crowded but as you see in the photos, Barcelona beaches are really big and they welcome everybody! We will give examples of Barcelona beaches photos so you can choose the best beach in Barcelona and enjoy swimming. So what are the most popular beaches in Barcelona city? 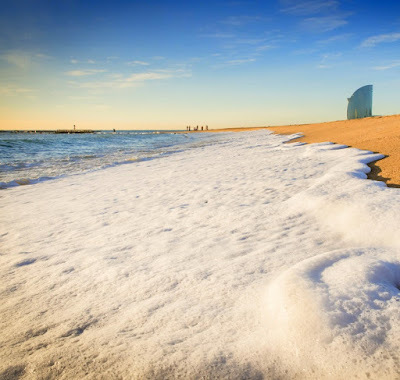 We will tell about each beach in Barcelona below but here we would like to give some Barcelona popular beaches names in Barcelona city like Barceloneta, Nova Icaria, Mar Bella and Bogatel. Barceloneta Beach: This beach is one of the most crowded and may be sometimes dirtiest beach in Barcelona but everybody likes having fun at this beach. You can see dancing vendors selling drinks or donuts and the music is on the air. If you like being in crowded sand then why don't you go there and have some fun like locals? Besides being active, Barceloneta beach is the nearest one to the city centre. You can access there by using yellow line metro or on foot in 20 minutes. However you go there you will have fun and can have your meal at American restaurants and bars. Nova Icaria Beach: If you want to lie down on the beach which is near the city centre but not as crowded as Barceloneta beach then Nova Icaria beach is the perfect choice for your summer holiday in Barcelona city. There are lots of facilities at this beach such as you can play table tennis or beach volleyball. Besides, as Nova Icaria is close to a shopping centre which has got a cinema with English subtitle you can have some time for snack and watch a film while going back at your hotel. You can go Nova Icaria by using Ciutadella and Vila Olimpica. You can walk and get the beach in ten minutes from these two metro stops. Mar Bella Beach: This beach is famous for its nudist visitors. Generally gays and lesbians like to sunbathe at Mar Bella beach. 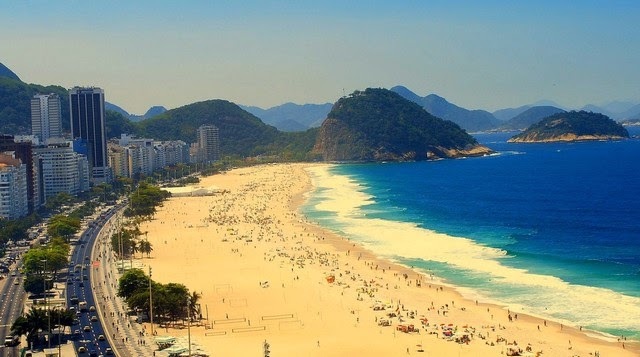 It's also famous for its water sports. If you like water sports such as windsurfing or kayaks Mar Bella beach is a must see place. As it's famous for its water sports, there are not many bars or restaurants at this area. Bogatel Beach: During your vacation in Barcelona city especially in summer, we think that you should see the best beaches in Barcelona city. Bogatell beach is very close to Olympic Port but it's a little far from Bogatell metro station which takes 15 minutes by walking but when you first get there you won't regret as this beach is the cleanest and calmest one when compared to above beaches. There are lots of restaurants and bars so you can have good time while sunbathing and enjoying the sea. So what about the safety, cleanliness and facilities in Barcelona beaches? If we should talk about these points we can say that for cleanliness all beaches in Barcelona are tried to be clean regularly and municipality has strict policy about the cleanliness. Of course beaches far from the city centre are more clean but don't worry about the beaches near city centre as they have EU blue flag and the people are generally careful about the environment. If you look for more facilities such as sports you can choose Mar Bella Beach but at all beaches there are music, party and beach volleyball areas. From April to September, you can join many events at these lovely beaches in Barcelona city. Green Flag; You can swim. There is no danger. Yellow Flag; You need to take caution while swimming. Red Flag; You may not see many red flags in Barcelona beaches but it means you can't swim here. Planning a travel to Barcelona city in summer will offer you lots of activities with its beaches, events, concerts or tourist attractions. So we suggest you follow your Barcelona city travel guide so that you won't waste time while taking notes about Barcelona travel in your agenda. Here below you can see the map of Barcelona beaches and other options if you like. Apart from sunbathing and swimming you can join beach parties in Barcelona city. Here there is a video for quick check to see what's going on in Barcelona beaches in summer! Enjoy the video.